Heavily based on The Manchurian Candidate, the political intrigue here makes this one of the best Doctor Who adventures ever filmed -- no, really. 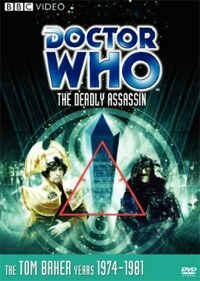 Let's just be blunt about it here: The Deadly Assassin may very well be one of the best Doctor Who stories ever written. No, really. The reason for this is simple: the Tom Baker-era Who episodes featured a well-versed writing staff, one that was unafraid to base the Time Lord's adventures off of classic literature, reaching into both old and contemporary fiction to find inspiration for the Doctor's adventures. Old warhorses like The Prisoner of Zenda have been dusted off to create modern-day fables like The Androids of Tara, and the show was all the better for it. These kinds of episodes did what any good Doctor Who should do: transcend its low-budget surroundings to become pop entertainment with actual substance -- and The Deadly Assassin is no exception. Heavily based on The Manchurian Candidate, this tale finds the Doctor arriving on his home planet of Gallifrey shortly before an assassination is going to take place. The target? The current Gallifreyan president, who is leaving his post. With an image of the forthcoming assassination forcibly beamed into his head, the Doctor makes his way through the crowds of political representatives to try and stop a would-be sniper for knocking off the Gallifreyan leader, only to find out that this has all been one very elaborate, very devious plan to frame the Doctor -- something that the Doctor only comes to realize after the President it shot and the Doctor is sent through a breakneck trial in order to get a conviction before a Presidential successor is named. Ripe with political intrigue? You betcha. During the first two episodes alone, the Doctor views the gathering of the political figures through the lens of the Gallifreyan media (who aren't entirely truthful), pulls out an outrageous law relic that brings his trial to an abrupt hold, and gets into a dangerous cat-and-mouse battle with a sniper in an alternate universe (in which clowns appear in mirrors and the hills, literally, have eyes). The Doctor is threatened execution without a trial, is tortured by his captors into giving a confession (sound familiar? ), and soon befriends leaders in the Gallifreyan government who only too-quickly become aware that corruption exists in virtually every facet of Gallifrey's political landscape, private killers taking the guise of Gallifrey's security force and fooling everyone in the process. ... and Tom Baker was certainly all for a solo Doctor, at least according to the 30-minute documentary "The Matrix Revisited". As the BBC keeps putting out DVDs, the bonus material they keep including just gets sleeker and more professional looking. Gone are the pointless "location scout" featurettes: here we get documentaries about the makings of this particular episode (in which Baker insisted he could do it companion-free), what the show's "frighten factor" is, and a detailed look on how closely the original Richard Condon novel The Manchurian Candidate translated into the realm of Doctor Who. The simple fact that they were able to get Baker back to do some of these is nothing short of a joy to behold, as the man himself is frequently lively and expository about his time in the TARDIS, making for a delightful romp all around. Old characters certainly come into play during this adventure (though that spoiler will not be revealed here), but with its layers of translatable political meaning, its sharp editing, and its very-real stakes, The Deadly Assassin is unquestionably one of the best Doctor Who adventures made, treated here with a generous amount of bonus ephemera and quality care, making the case for calling this particular outing a "must-own" kind of event.